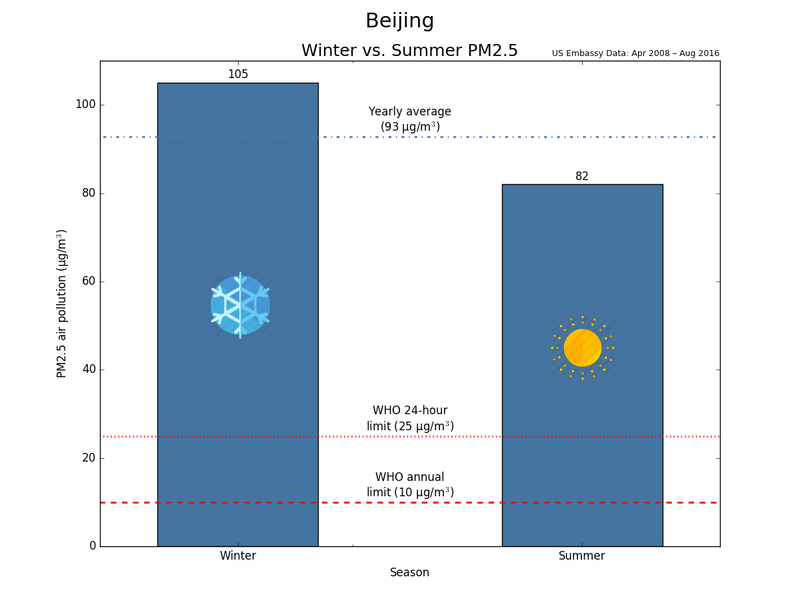 How much worse is winter air in Beijing? Another year, another winter. As winter arrives in Beijing and soon in Shanghai, I got to wondering: how much worse is winter air in Beijing? 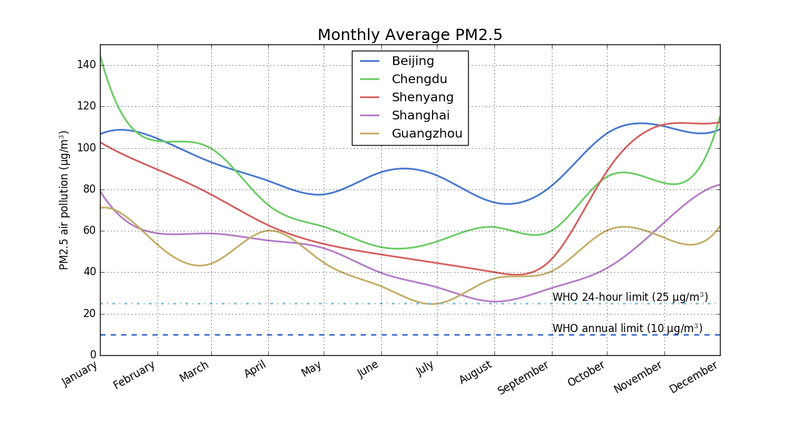 To get to the bottom of it, I analyzed the last eight years of US Embassy PM 2.5 data for Beijing and Shanghai. I found that the capital’s air has averaged 111 micrograms in the winter versus 92 micrograms for the rest of the year. 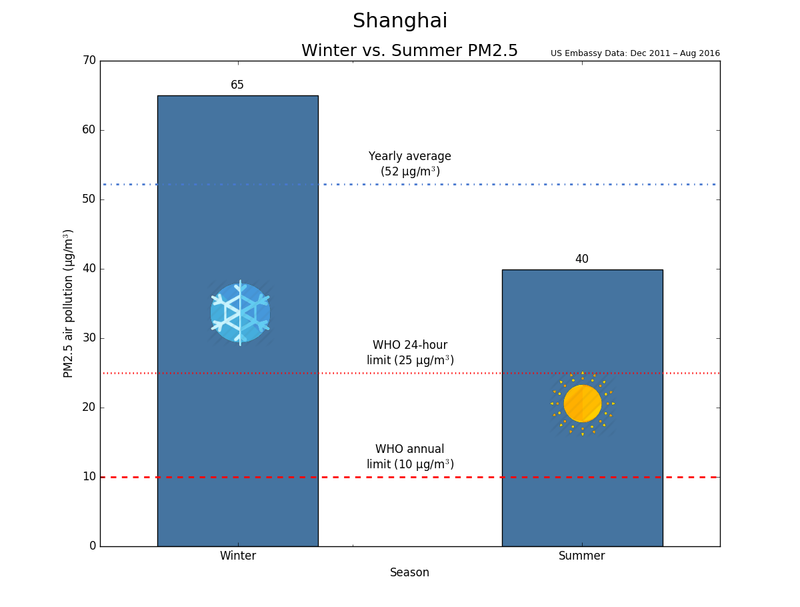 Shanghai was a little better at 65 micrograms in winter versus 40 micrograms in summer. Just how bad is that? The WHO 24-hour PM 2.5 limit is 25 micrograms (the year PM 2.5 limit is just 10 micrograms!). That means Beijing’s summers average three times the 24-hour limit, and winters average over four times the limit. The data from Mr. Cyr you cite is from May 2014. E.g. the Totobobo model used by him has been replaced by a newer model by now, which possibly performs differently. This is worth noting, I think.